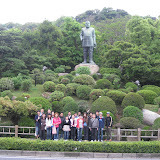 New students are getting used to Japan now, They enjoyed one day trip by Kagoshima city view tour bus and found many good points of Kagoshima. They also tried Kagoshima Loud Voice Contest on 29th Apr. and 3 of our students got a prize!! If we dream, everything is possible.